The Congress chief claimed that the Rafale deal had snatched job opportunities from young Indians, including engineers, as the planes will be manufactured abroad. 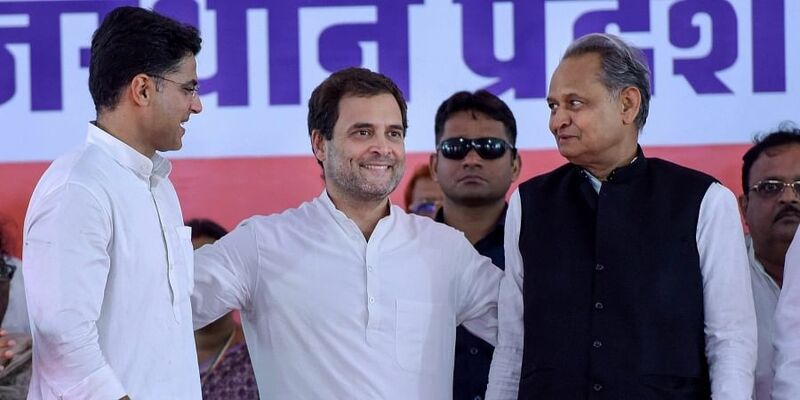 JAIPUR: Congress chief Rahul Gandhi today targeted Prime Minister Narendra Modi again on the Rafale aircraft deal as he launched his party's campaign for the assembly polls later this year in Rajasthan. Directly accusing Modi of corruption in the deal for the French fighter planes, he said the prime minister had favoured his businessman 'friend' Anil Ambani by getting him the 'contract'. The reference was to the business that foreign manufacturers are required to bring to Indian firms when a defence deal is signed with the government, under the country's offset policy. Ambani has already rejected Rahul Gandhi's allegations and emphasised that the government had no role in the Rafale-manufacturing French firm Dassault picking up his company as a local partner. Gandhi said the price of the Rafale plane fixed now is about "three times" the amount agreed upon during the previous Congress-led government. He said this 'corruption' by Modi will become apparent over time. "Our youths more honest, capable and stronger than the Chinese but it is a matter of shame that despite having almost equal population, they are getting fewer job opportunities," he said. He questioned why Rs 2,30,000 crore could be 'written off' as bad loans to 15 or 20 big industrialists, but the government could not help debt-ridden farmers. When farmers are unable to pay back their loans, they are called defaulters and are jailed. But bad debts of big industrialists are called non-performing assets (NPA), he said. Attacking for the sake of opposing has made Rahul a fake politician. In the parliament he hugs him and winks at others.